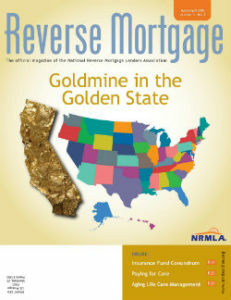 Our cover story for this month’s issue of NRMLA’s awarding-winning Reverse Mortgage magazine, written by former Reverse Review editor Jessica Guerin, examines the reverse mortgage market in California. While California has the largest population of any state, the next three largest states – Texas, Florida and New York – have a combined population that is almost twice that of California. And yet, California has more reverse mortgages than those three states combined. It takes a lot more than just population to explain this. So Jessica went out to search for other reasons. We thought at least some of the answers might be replicable and thereby help the industry build up other markets. The magazine issue also features an analysis of FHA’s Mutual Mortgage Insurance Fund written by staff writer Mark Olshaker. On the one hand, the MMI provides borrowers with valuable protection and creates a level of trust in the market. On the other hand, the statutory requirement that it be net neutral in each fiscal year’s book of business has led to frequent adjustments to the HECM program that rattle businesses and create consumer confusion. There has been conversation this year, following the issuance of the annual actuarial review, and remarks from HUD Secretary Ben Carson, that perhaps the MMI is not the right home for the HECM program. Mark Olshaker reports on these conversations as well as on how HECMs ended up in this fund and what the new options may be.